THE ROAD TO KHALISTAN: Brother Laibar Singh Decides To Return To India? Brother Laibar Singh Decides To Return To India? I just received this news via my Google Alert for "Laibar Singh." I have not yet confirmed this; I will get in touch with my contact as soon as possible and let you know when she makes a response. To Brother Laibar Singh Ji, I make this personal statement, roached from an old song, "You ain't heavy, you're my brother...No burden are you to bear, we'll get there...The load doesn't weigh me down at all...You ain't heavy, you're my brother." Whatever you choose to do, please know that my prayers and sisterly love go with you. We know that all that happens is the Hukam of Vaheguru. The kirpaa of Vaheguru is unknowably great and I am sure that whatever happens, you are loved more than you can even imagine. I am sorry I have no money to send. Since I live in America, not Canada, at present, my medical bills have drained all of our small resources. You do have, as always, everything I can give. Dear Brother, remain always in Chardi kala. Be strong! Be brave! Have courage! Remember who you are and what you are and whar you are about! My Dad used to say that to me all the time. I'm happy to pass it on to you. You have given us a great gift. For a time - a short time, to be sure - but for a time, we acted as a unified community. We found out what it felt like to stand together united. I pray that we can now build on this. That will be your legacy among your Canadian sisters and brothers. So, again, dear Brother, always remain in chardi kala! Gurfateh! What the heck! For those of you who don't know this song, here are all the words. It happens to be one of my all time favourite songs. Of love for one another. VANCOUVER (NEWS1130) - Paralysed refugee claimant Laibar Singh plans to return to India voluntarily. He's apparently fed-up with the process. There are reports Singh is saying he misses his family in India, and doesn't want to be a burden, especially when there is not much hope of help from the Canadian government. He arrived in this country in 2003 on a false passport, fled from Montreal to Vancouver after a deportation order, then suffered a massive stroke that left him a quadriplegic. Harjinder Thind, News Director with Red FM, says Singh hasn't recovered, but he feels better. Singh has been living in sanctuary at various Sikh temples. Thind says no date has been set but it's likely to happen some time in the next two weeks. Singh will be given money that's been donated (approximately $32,000 Canadian). ABBOTSFORD, B.C. — A paralyzed refugee claimant who sought refuge in B.C. Sikh temples says he is ready to leave his sanctuary and return to India. Laibar Singh has been living in various temples since he was ordered deported more than a year ago, successfully avoiding three attempts to deport him from the country. Now Swarn Gill, president of the Abbotsford temple where Singh is living, says the widower misses his four children back home in India. Gill says Singh also fears he could be arrested if he leaves the temple because officials with the Canada Border Services Agency have warned him that's what will happen. Gill says the paralyzed man, in his 50s, no longer has hope that the Canadian government will allow him to stay in Canada on compassionate grounds. 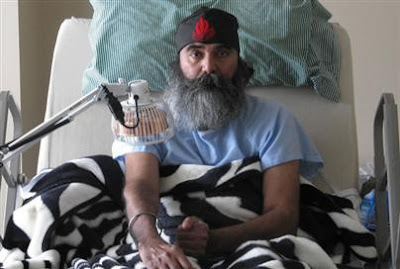 Singh used a false passport to enter Canada in 2003 and fled from Toronto to Vancouver, where he suffered an aneurysm that left his paralyzed. hey! You left our my unbiased article! Darcey ji - I had not read your post when I post wrote this one. I will, however, remedy this oversite in a brand-new post. I hope you don't mind if I, making full use of the "fair use" doctrine, reprint your article. I can't have you feeling slighted, now can I? BOLE SO NIHAL SAT SHRI AKAAAL!!! WAHEGURU JI KA KHALSA WAHEGURU JI KI FATHEH!!!!!!!!!! !